Surprisingly, Sam was not a fan of S.T.U.N. Runner. Yesterday, we had Godfather’s Pizza for dinner in Pekin. That particular restaurant holds a lot of memories for me. We’ve been going there as long as I can remember, and the pizza has always been delicious. It comprises about 85% of all birthday dinners in my family. It also happens to be the site of the very first time I played Ms. Pac Man, and countless other arcade adventures. It pleases me to no end that the place is still very much as it was some 30 years ago, except for the part where it’s almost never busy and a lot of the arcade games are old and broken. I worry that the place doesn’t have much time left. All the other Godfather’s restaurants in the area have closed, and the company itself isn’t doing so well. We don’t go very often, and I never really understand why. I think I just take it for granted. I’d had a craving for pizza all day yesterday, and we’ve had Papa Johns and Mickie’s about four thousand times in the last month. Sarah suggested Godfather’s, and it sounded really good. Sam, being Sam, wasn’t particularly interested in eating anything, so I mentioned they’d have arcade games. He squealed and yelled “OKAY!” and ran to get his shoes on. On the way there, we talked about what kind of pizza we were going to get. Then Sam said something I’ll never forget. If you heard a pop about 6pm yesterday, that was my heart exploding. I could not craft a sentence that more perfectly fulfilled my every need as a father. I was stunned. My lower lip quivered. When we got there, he ran around in circles until we ordered, and then he ran to the machines and did some more circles while I got quarters from the change machine and told him how the sound of the coins coming out used to be my favorite noise in the world. 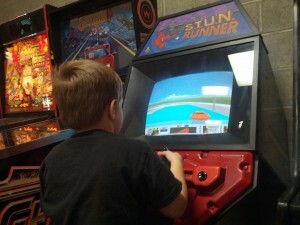 Since he’s so young, he usually doesn’t stick around to finish whatever game he’s playing — unless it’s a driving game. For some reason, those keep him. His experiences with gaming are so different from mine at that age. He’s used to my Xbox packed full of games he can switch between whenever he wants, and he looks at me like I’m crazy when I tell him we’re out of quarters. But he loves bright colors and weird synthesized noises, and that means he loves the old stuff from when I was a kid — even if it’s just for awhile. He’s been bugging me to play games on the MAME cabinet in our dining room lately. I’ve had a couple parts loose and some stuff that needs configured on it for a few months, so it hasn’t seen much use. He heard Froggy’s Lament from Buckner & Garcia’s Pac Man Fever album on the way back from Grandma’s last week, and he’s been wanting to see that froggy. I think it’s time to fix that. Definitely loving the whole “dad” gig right now.